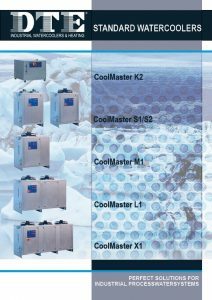 Standard watercoolers | Dutch Thermal Engineering n.v.
DTE’s standard watercoolers, the CoolMaster, consists of components from the standard production range of well-known suppliers. All building elements are fitted in such a way that they are not only easily accessible but also easily exchangeable. Careful selection, calculation and set-up of the components is achieved using computer programmes DTE designed especially for this purpose. In this way DTE houses the maximum cooling capacity in a minimum of space. possible algal growth caused by the incidence of light. Furthermore, the warm air produced by the condenser does not remain in the CoolMaster, but is blown out directly by a powerful axial fan. These important DTE constructional features guarantee the long life of the CoolMaster.